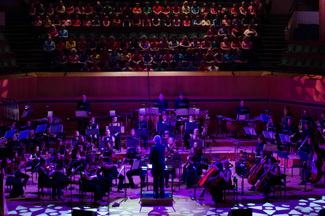 The British Sinfonietta is one of the UK's leading independent professional orchestras. The orchestra is involved in a variety of engagements including classical concerts, choral concerts, televised events, studio recording sessions and film screenings with live soundtracks. In recent years the orchestra performed extensively in England, Scotland and Wales as well as visiting Western Europe. Highlights include the televised world premiere of Adiemus Colores by Karl Jenkins at the Llangollen International Musical Eisteddfod, screenings of Casablanca at the Royal Opera House in London, Video Games Live in Glasgow, London and Manchester, screenings of Home Alone in Denmark, and the London Welsh Festival of Male Choirs at a sold out Royal Albert Hall in London. The British Sinfonietta is available for concert engagements throughout the UK and worldwide. We also regularly work with choirs for choral concerts in England and Wales. Please contact our office for further details.